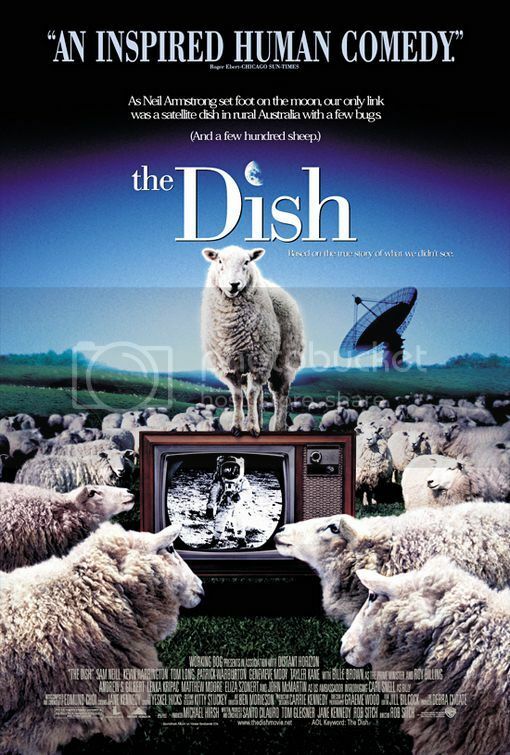 The Aussie faux historical The Dish is a sweet, wholesome movie exhibiting much of the usual irreverent humanism that characterizes the region's more enduring comedies (think Strictly Ballroom or Muriel's Wedding). The Dish centers around the Apollo 11 mission to the moon, and Australia's involvement via its satellite communication and televised broadcasting of Neil Armstrong's legendary first steps. In the usual style, a motley crew of gently quirky scientists are assembled - led by the wry Cliff (Sam Neill), with the young, spaced out Glenn (Tom Long) and the puckish Mitch (Kevin Harrington) in assistance - and advised by the boorish Yankee NASA representative, Al (Patrick Warburton, Elaine's boyfriend from Seinfeld). The tone is one of ad hoc genius and cobbled-together solutions for the curveballs these scientists encounter in their job to track and broadcast the Apollo 11 communications. The humor is gentle, the history a bit tweaked and the vibe generally warm and bittersweet. It's a great movie for chilling out with tea (and maybe a blanket), and it leaves you with a warm fuzzy feeling inside. There's also - as with all mainstream films that deal with the Apollo missions - a lot of celebration of man stuff, a relishing of our technological achievements. Think long, loving shots of the satellite. Couple this with some Australiana nostalgia - doo-wop and flower power acoustic guitars feature heavily in the satellite-fetish shots - and the viewer is lulled into a comfortable, warm zone of easygoing optimism. Sam Neill, one of the gods of our idolatry (OK, our pantheon is pretty big), is his usual craggy, sardonic self - and we love him for it, as we always do. This time we even get the bonus of sweaters and pipes! Oh, our hearts - be still! The people who are not Sam Neill are also fairly decent, but they suffer somewhat from the fact that they're not - in fact - Sam Neill. We should also note that one character - the comical mayor's comically angry feminist daughter - was a little ruffling to our feathers. Every line Feminist Girl spouted was meant for ridicule, even though some of them were, well, pretty good points. Poverty alleviation or space exploration? It's a good point! And mocking the poverty of India - which was, essentially, the punchline of one of the jokes at her expense - wasn't very funny. Oh, Sam, why did you laugh? For money? We'll give you money! I disagree. My partner's family love this movie, they are always watching it. It's far too sugary to stand up to repeated viewing. The angry feminist is just the most blatant of the many dubious attitudes they sneak in. Also, your Sam Neill crush baffles me. scott - You are a harsher man than I. Sam Neeeeeeill.